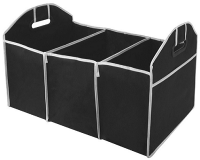 Add a touch of convenience to your shop with this fantastic car boot organiser. Made of a sturdy and robust polycanvas construction, the organiser splits up your shopping into three identical compartments for keeping foodstuffs separate, helping you identify exactly what you still need. When you get to the car, simply lift the organiser via the two carry-handles and place straight into the boot, saving on hassle and plastic bags. 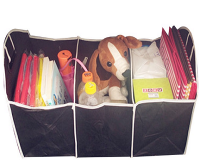 It collapses for easy storage, and has pockets located on either side for keys or other valuables.